Editor’s note: You can read part 1 here. In 2003 Kobe Bryant was going through a myriad of issues off the court. There was talk of his jealousy toward teammates, talk of a feud between Bryant and soon-to-be-former head coach Phil Jackson, and his team was about to lose the services of one of the best NBA big men of all time as Shaquille O’Neal prepped the runway for his departure. In July of that year, Bryant faced charges of sexual assault by a hotel worker in Colorado. After his acquittal in 2004, transcript records released by the police revealed that while being interrogated, Bryant had fingered O’Neal as being unfaithful in his marriage. This bit of information did not go over well with Shaq fans. Despite these blemishes on his credibility and commercial marketability, Bryant would lose himself in basketball and spend the better part of the next decade becoming the best player in the NBA. Rewind to 1999, when Kobe Bryant’s game had taken yet another quantum leap toward greatness. His array of scoring moves off the dribble seemed to multiply exponentially as defender after hapless defender was left cowering in his wake. In Bryant’s fourth and fifth seasons as a professional, he and O’Neal would win the second and third of their NBA championships together. In 2001 the Los Angeles Lakers would beat a Philadelphia 76ers team led by Allen Iverson 4-1. Shaq and Kobe would average 30.4 and 29.4 respectively. Their combined scoring average placed them among the top five scoring duos in the history of the NBA Finals. Their unquestioned dominance went unchallenged in 2002 as well. The Kobe-Shaq combination would win one more championship in 2002 after sweeping the Jason Kidd-led New Jersey Nets 4-0. The following season, the Kobe-Shaq feud that had gone largely unheard of in the media since 2001 was born anew as Kobe called out Shaq for being out of shape, for exaggerating the extent of his injuries to cover up his weight and for threatening not to play hard if he wasn’t passed the ball more during the 2002-2003 series. The Lakers’ bid for a four-peat was squashed by the San Antonio Spurs in the Western Conference semifinals. The 2003-2004 season would end in disappointment as well, with a cocky and self-assured Los Angeles Lakers squad losing to the Detroit Pistons in the NBA Finals. Los Angeles would lose the series in what would be jokingly described as "the first five-game sweep in the history of the NBA Finals." The Lakers would lose 4 games to 1. Afterward, claims of a ball-hogging Bryant were reignited. After the loss in the Finals, head coach Phil Jackson retired. There was a tremendous amount of speculation circulating regarding Bryant’s role in his departure. At the All Star break, Jackson had drawn first blood in stating that he would not return to coach the Lakers if Bryant returned. Shaq, after learning of Jackson’s departure, and hearing General Manager Mitch Kupchak say he was looking to move him, demanded to be traded. "The direction they’re going … I don’t want to be a part of this," the Albany Herald quoted Shaq as saying. O’Neal would eventually be shipped to the Miami Heat. After briefly flirting with the Los Angeles Clippers, Bryant would re-sign with the Lakers for seven years at $137 million. 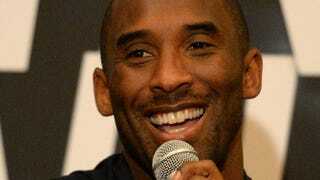 O’Neal added, "When it came to my leaving, [Kobe] could have spoken up. He could have said something. He didn’t say anything." Assistant coach Tex Winter said, "[O’Neal] left because he couldn’t get what he wanted—a huge pay raise. There was no way ownership could give him what he wanted. Shaq’s demands held the franchise hostage, and the way he went about it didn’t please the owner too much." After Shaq’s departure, it was clear that Lakers ownership was all in on Bryant. Increasingly, his pedigree would be compared more and more to that of Michael Jordan. No longer was he simply mimicking Jordan’s scoring ability. Bryant was increasingly known as a lockdown defender and was named to the first of nine first-team NBA All-Defensive teams in 2000. It was becoming increasingly clear that he was considered the second coming of His Airness, despite his assertions to the contrary. While Bryant would say he copied the games of all the great big guards who came before him, Jordan seemed to believe otherwise. Despite his alleged role in the departure of O’Neal, Bryant would spend the better part of the next three years searching for a suitable Robin to his Batman. First it appeared as though versatile forward Lamar Odom was the clear choice, but he rarely played to his considerable talents. The Zen master Phil Jackson would return to the Lakers amid great fanfare in the 2005-2006 season. In the meantime, O’Neal would win an NBA title alongside his new Robin, Dwyane Wade, and the Miami Heat in 2006. Bryant and the Lakers would not enjoy much postseason success, but Bryant would set a franchise mark for most points scored in a game with 81 points versus the Toronto Raptors. That number placed his performance second behind Wilt Chamberlain’s 100-point game for most points scored in a game. But it was glaringly apparent that, no matter how many points he scored, Bryant needed help to return to the pinnacle of the NBA. With the acquisition of All-Star power forward Paul Gasol from the Memphis Grizzlies late in the 2007-2008 season, the Lakers would return to the NBA Finals, only to be defeated in six games by the Boston Celtics. After a full season with Gasol in the fold, and an increasingly productive Andrew Bynum gaining confidence on a nightly basis, Bryant and the the Lakers would win two NBA Finals championships in 2008-2009 and 2009-2010, giving him one more championship than former teammate-turned-rival O’Neal. It is at this point in his career that Bryant’s place in the hoops hierarchy was secured. He is easily among the top 10 best players in NBA history, perhaps even top five. But that wasn’t enough for Bryant. His competitive drive would not be satiated until another title was brought to Los Angeles.